The only British manufacturer of oilfield equipment after World War 2 was the Oil Well Engineering Company (O.W.E.Co Ltd) at Cheadle Heath, Stockport. Made up of a consortium of Shell, BP, Iraq Petroleum Company, the UK Government and the National Supply Company of America they entered into arrangements for the O.W.E. Co Ltd to manufacture in the UK National Supply's oil rigs and other associated equipment under licence. O.W.E. 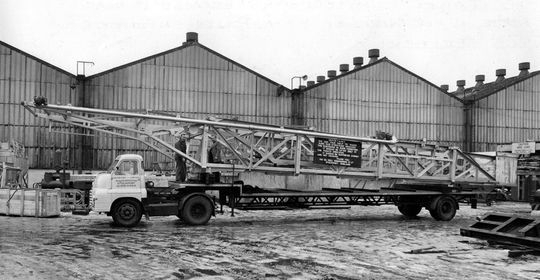 Co Ltd was the largest manufacturer of oilfield equipment outside the USA employing up to 1,000 people during World War 2 and around 700 during the 1950's. American owners National Supply closed the Oil Well Engineering works at Cheadle Heath in 1998 after investing around £4m in the factory only the year before. 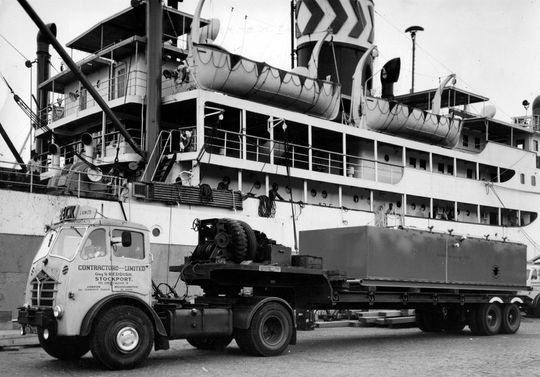 Throughout the 1950's Edward Beck & Son Ltd were contracted to deliver vast amounts of oil well drilling equipment on behalf of the Oil Well Engineering Company Ltd to Liverpool docks for export to the Persian Gulf. 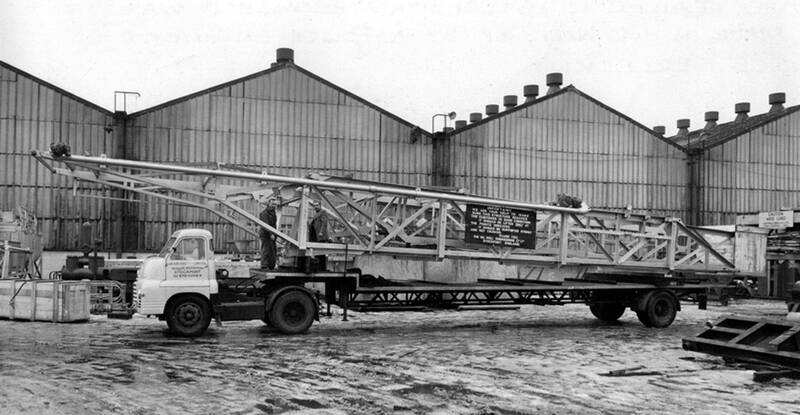 Edward Beck's former military AEC Matador is seen here in 1952 after loading up with drilling equipment from the Oil Well Engineering Co Ltd at Cheadle Heath Stockport whose premises can be seen in the background. Click on this or any other image in this gallery to view full size. Diamond 'T' 6X4 prime mover Reg No PML 804, pictured here in 1955, is at the premises of the Oil Well Engineering Co Ltd Cheadle Heath Stockport after loading up with drilling equipment destined for export via Liverpool Docks. 'S' Type Bedford 4x2 tractor unit Reg No MJA 789 is parked up in the premises of the Oil Well Engineering Company Ltd in Cheadle Heath near Stockport. 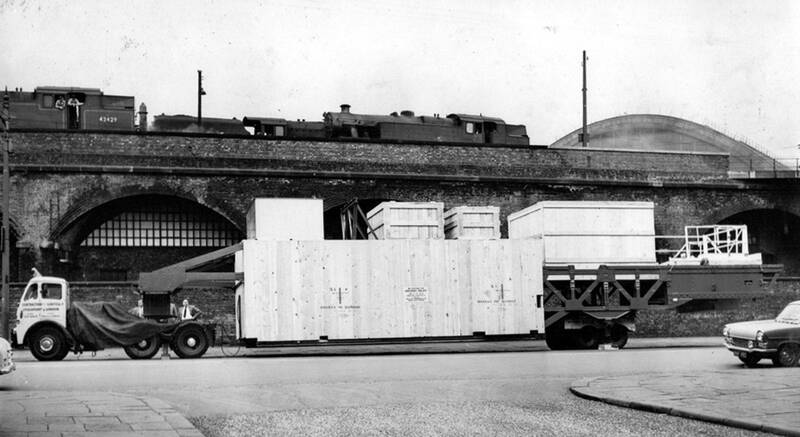 It is coupled to a purpose built trailer made in Edward Beck's own workshop at Stockport by Polish engineer Joe Terlecki. Driver Vernon Macro chats to Teddy Beck alongside another load of oil well drilling equipment destined for the Persian Gulf via Liverpool Docks. 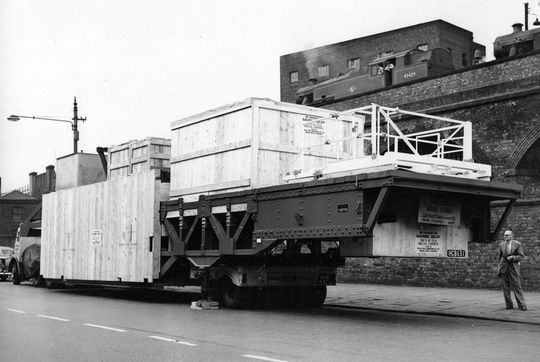 One of the largest loads to come out of the Oil Well Engineering factory at Cheadle Heath is pictured here about to set off on it's journey to Liverpool. 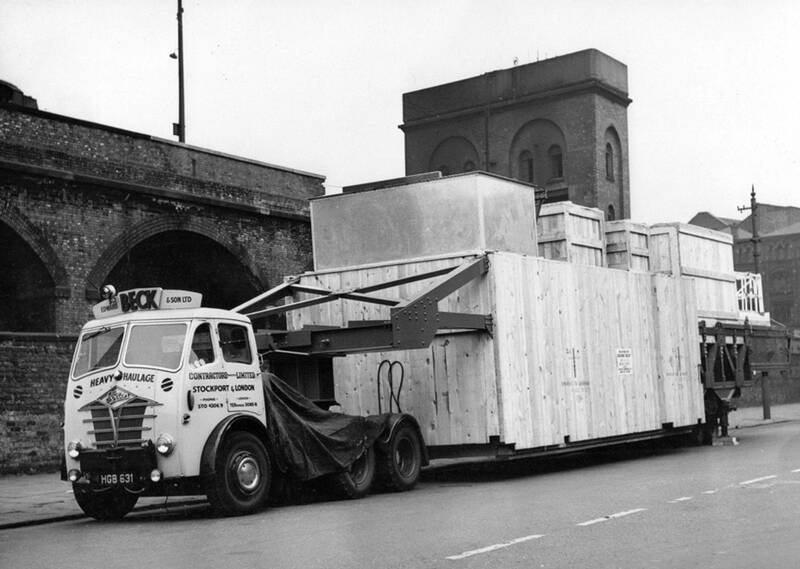 This is the first of a series of pictures showing this unusual shaped load which was destined for the Persian Gulf via Liverpool Docks. 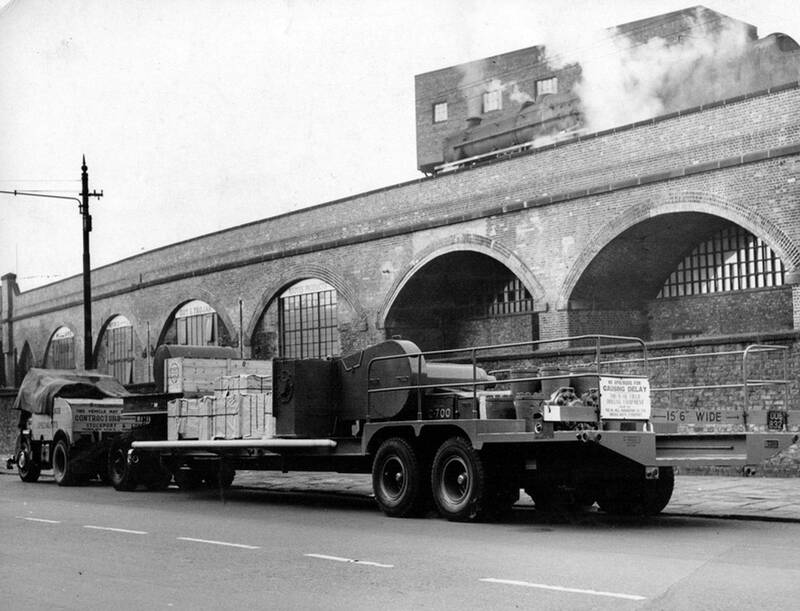 A side view of the unusual shaped load which was destined for Liverpool Docks. 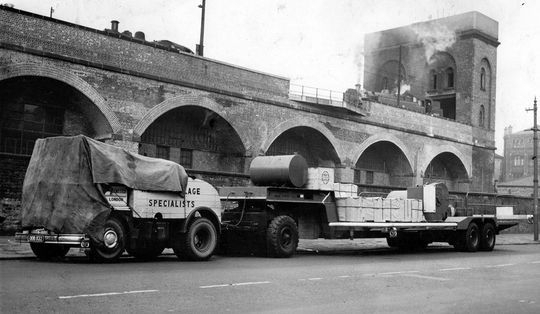 Seen here parked on Whitworth Street, near the centre of Manchester, this particular street was a designated parking area for heavy goods vehicles in those days a far cry from the parking meters that abound in the area today. 6x4 FG Foden S18 Reg No HGB 631 was assigned to haul the large load from Stockport to Liverpool Docks. It is pictured parked up on Whitworth Street near the centre of Manchester, where in those days you could park up over night with out fear of any damage being done to vehicle or load. 6x4 FG Foden S18 Reg No HGB 631 arrives at Liverpool Docks and awaits unloading on the quayside. The ship was owned by Strick Line, who had regular sailings out of Liverpool docks and were one of the principle shipping lines serving ports in the Persian Gulf, taking equipment for the oilfields throughout the 1950's. Edward Beck's FG Foden S18 Reg No KDB 703 also arrives on the quayside at Liverpool Docks with another piece of equipment manufactured by O.W.E. destined for the Persian Gulf. 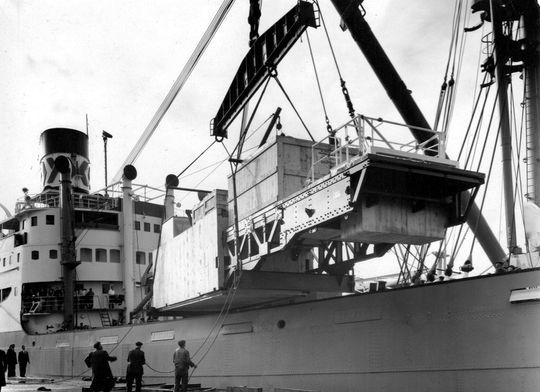 Job done as the load is lifted up and away and stowed on board the ship which was destined for the Persian Gulf. Foden ballast tractor Reg No ODB 832 and it's load are seen here parked up for the weekend on Whitworth Street close to the centre of Manchester which was a designated parking area for heavy goods vehicle throughout the 1950's and 1960's. 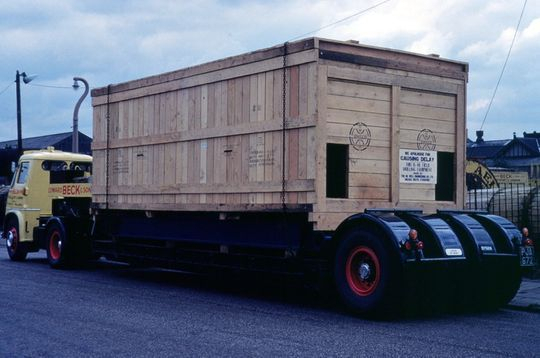 Covered with a tarpaulin to protect it from the elements during the weekend the Foden is coupled up to a purpose built trailer measuring 15ft 6in built by the Oil Well Engineering Co Ltd destined for the Persian Gulf. The steam engines in the picture were 'pilot' engines used for shunting carriages at the near by Central Station. 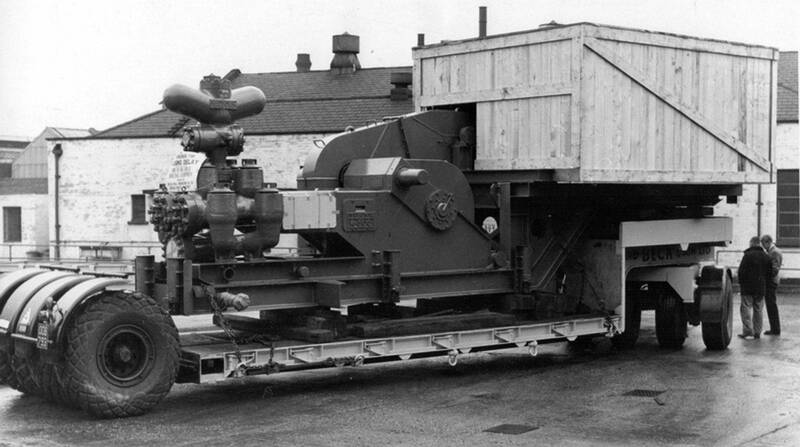 The 15ft 6in wide trailer built by the Oil Well Engineering Co Ltd would have been used abroad as a mobile drilling platform on its arrival in the Persian Gulf. 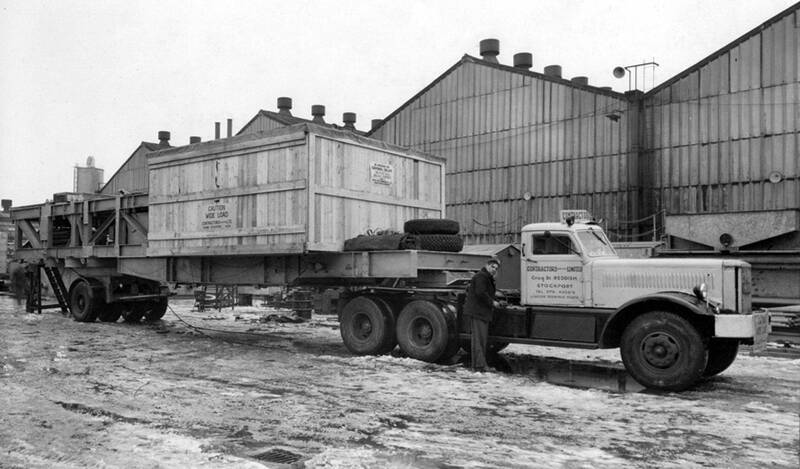 A close up shot of the 15ft 6in wide trailer built and designed by the Oil Well Engineering Co Ltd. 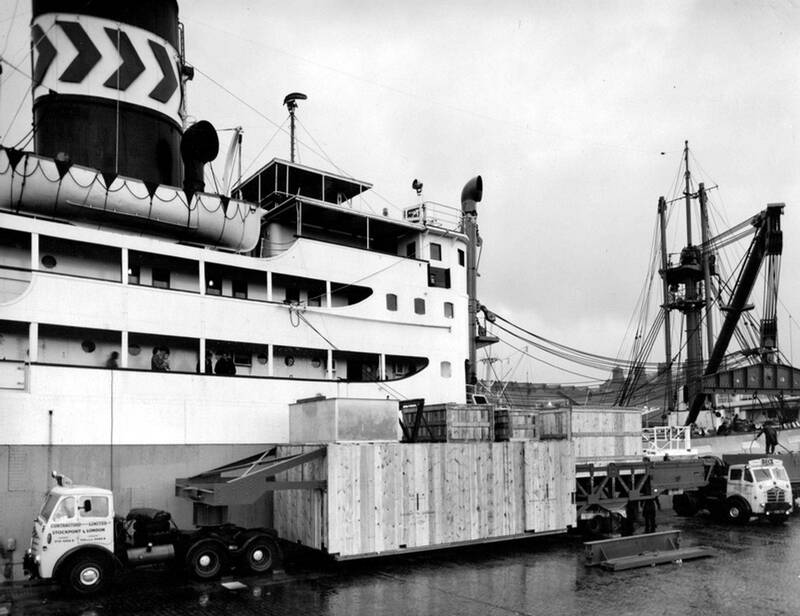 This extra wide trailer and all the attached equipment on board would have been used as a mobile drilling platform on its arrival in the Persian Gulf. 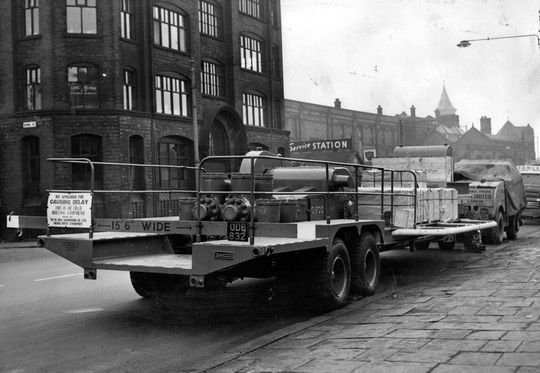 Parked outside the depot on Greg Street this huge packing case of Oil Well Engineering machinery is seen here on a brand new Dyson low-loader ready for departure to Liverpool Docks.